Attendants: 2 or 3 required; can be you or us, must be us at a school or public location. 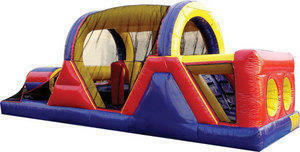 This inflatable obstacle course can be an amazing centerpiece for a school, church, company event or any party. The inflatable play structure begins with a front-loading obstacle entrance, taking participants through tunnels and pop-ups to facilitate maneuvering skills and build confidence. The challenge obstacle then leads to an exciting barrel race-exiting crawl through, all to encourage hours of wholesome enjoyable physical activity. Two adventurers can start every 10 seconds making this one of the best units for large groups when you need to give many people their turn in the shortest possible time. Each inflatable play structure has mesh windows for easy viewing, and is constructed of the fire-resistant, lite n' strong™ vinyl for easy portability, durability and safety. Children, teens, and adults can climb, slide, survive, and race all in one attractive, cleverly designed unit. There are tunnels, a rock wall, slide, pop ups, and a log climb to challenge! This Obstacle Challenge will rent fast, so book early for this sure fire winner!